Waking up early can be hard, but once you are out the door, and particularly when you choose to walk or bike, the experience quickly starts trending towards the positive. Beautiful weather doesn’t hurt either. 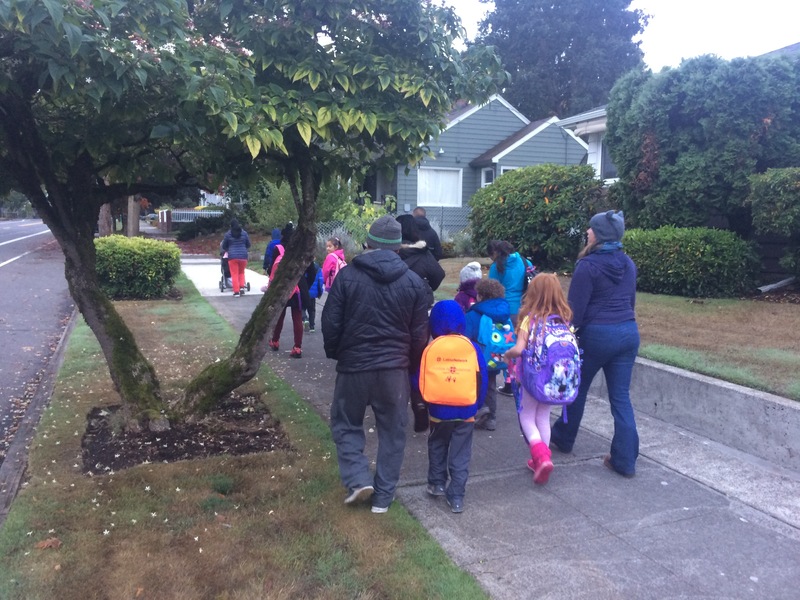 This past Wednesday, October 10th was a prime example as the community turned out in impressive numbers for International Walk and Bike to School Day at César Chávez School in North Portland. William Francis, the Community Cycling Center’s Safe Routes to School Coordinator at the school led a walking school bus that started from Clarendon School and continued up N Portsmouth Ave. We gathered students and families along the way, and by the time we reached the front of the school we were 15 people strong. PE teachers Sam Balto and Ed Rosario were there to greet students and families with music, small prizes, and a photo booth to celebrate the occasion. In the end, there were just over 100 walkers and approximately 25 bicyclists counted on coach Ed’s scoreboard. For many families, walking to and from school is a daily event and there are several difficult crossings along the way. William is currently engaging with the school community to make improvements to the walking and biking environment around the school through the establishment of a 4/5th grade cross guard team, participation in a parking education campaign, and also an after-school Bike Club program happening this fall. We are working together to make the situation safer so that walking and biking to school is accessible and appealing to all families.